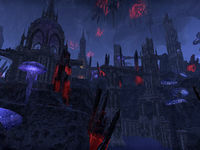 The Spiral Skein is a part of Mephala's realm of Oblivion. This part of the realm is where the Golden Knight has been imprisoned and is visited during the related quest. This location is not to be confused with the prequel DLC quest location The Spiral Skein. This page was last modified on 18 January 2019, at 19:12.